A few of our staff members have been with Zahner & Associates since Michael Zahner acquired the firm in 1991. 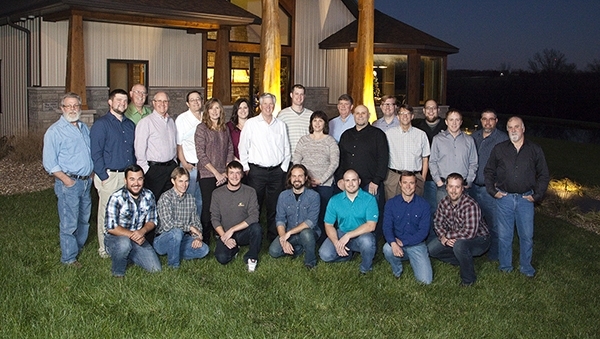 At Zahner & Associates we realize our staff is the backbone of our company. Their decades of hands-on experience is one of the many characteristics that distinguishes Zahner & Associates from many survey companies. Our collective experience spans over 40 years and three generations. We ensure our staff are thoroughly trained in the latest technology and best practices. When cutting-edge technology is partnered with decades of on-the-job wisdom, our clients see challenges minimized as solutions are maximized. Zahner & Associates employs several experienced Party Chiefs who are thoroughly trained in Electrical, Mining, and Construction Safety. Licensed in Missouri and Illinois, Mr. Zahner brings with him more than 30 years experience in the surveying industry. He is a past president of Missouri Society of Professional Surveyors, as well as the past president of the Missouri Association of County Surveyors. He is an active member of the Missouri Society of Professional Land Surveyors Association and the National Society of Professional Surveyors. Licensed in Missouri and Arkansas, Mr. Layton has been with our firm since 1991. He has been a registered land surveyor since 1980. He has a Bachelor's of Science in Geology and Geography and is a member of the Missouri Society of Professional Surveyors and the National Society of Professional Surveyors. Licensed in Missouri and Iowa, Mr. Carrow has been with our firm since 1996. He has been in the surveying industry since 1994. He has a Bachelor's of Science in Industrial Management and a Bachelor's of Science in Cartography/Surveying. He is also a member and past president of the Missouri Society of Professional Surveyors, as well as a member of the National Society of Professional Surveyors. Licensed in Missouri in 2003, Mr. Denninger studied surveying at Jefferson College and has been in the surveying industry since 1997. He was an early integrator of GPS solutions at Zahner & Associates and has a vast amount of experience with project management, route surveys, construction staking, laser scanning, and design build projects. He is a member of the Missouri Society of Professional Surveyors and the National Society of Professional Surveyors. Licensed in Missouri and Arkansas, Mr. Huck has an Associates of Applied Science, Civil Construction from Jefferson College, and has been in the surveying industry since 2000. His experience with project management, boundary, ALTA, topographic, and construction surveys make him an asset to any project. He is a member of the Missouri Society of Professional Surveyors and the National Society of Professional Surveyors. Licensed in Missouri and Illinois, Mr. Williamson has been in the surveying industry since 1991. He is a past president of the southwest chapter of, and a current member of the Illinois Professional Surveyors Association. Mr. Zahner leads the company in business and technology development. Colin acquired his surveying studies through the University of Wyoming and has been in the surveying industry since 2006. He is a member of the Missouri Society of Professional Surveyors and the National Society of Professional Surveyors. His experience includes managing Mobile LiDAR and 3D laser scanning projects, and extended route surveys. Licensed as a Professional Engineer in Missouri, Illinois, Iowa, Arkansas, New York, and Arizona. Mr. McKlin has a Bachelor of Science in Civil Engineering from the University of Missouri – St. Louis. He has experience with roadway design, storm and sanitary sewer design, pedestrian facility design, site development, transportation construction inspection, and GIS mapping. He is a member of the Missouri Society of Professional Engineer and the American Society of Civil Engineers. Mrs. Hayden has been with our firm since our beginning in 1991 as an experienced drafts person. She has an Office Certificate from Southeast Missouri State University. Mr. Sparkman has a Bachelor’s Degree in Business Administration from Harris Stowe, and has been with our firm since 2013. Waylon estimates, schedules, and coordinates with our field crews to ensure that our clients’ projects are completed in a timely and cost effective manner. He has extensive experience with Mobile LiDAR, 3D laser scanning, and point cloud registration.